As well as a striking new reverse design for 2019, the 1 oz Australian Kookaburra is the first Perth Mint coin to feature Australia's new coinage portrait of HM Elizabeth II. No more than 500,000 of the 1 oz Kookaburra will be produced - order today with coininvest.com and be among the first to own this landmark silver coin. Exquisitely crafted from 99.99% pure silver, the Kookaburra is Australia's longest continually running bullion coin series. The coin first appeared in 1990 and is lauded for its exceptional annually changing reverse designs featuring the kookaburra, the largest bird in the kingfisher family and a much-loved symbol of Australia. For 2019, investors have the option of impressive 10 oz and 1 kg coins as well as the perennially popular 1 oz Silver Australian Kookaburra. The Perth Mint artists have chosen a meticulously detailed image of a kookaburra perched on a partially submerged branch for the 2019 silver coin. In the background, the sun sinks into the rippling waters while a leafy tree frames the bird and merges with the coin's rim. The words AUSTRALIAN KOOKABURRA curve around the top border while the coin's date, weight and purity are displayed at the base. This immaculate reverse design is finished with the mint's famous 'P' mintmark on the left. The 2019 1 oz Australian Kookaburra is also the first silver bullion coin issued by the Perth Mint to feature the newest portrait of HM Queen Elizabeth II by UK Royal Mint artist Jody Clark. As always, the Queen faces to the right and Her Majesty is resplendent in the famous Royal Diamond Diadem. Why choose the 2019 1 oz Silver Australian Kookaburra? The coin's purity and annually changing reverse design has made it a popular option for investors since its inauguration in 1990. The 2019 1 oz Australian Kookaburra is likely to be every bit as successful as its predecessors, particularly with the added appeal of a brand new obverse design. 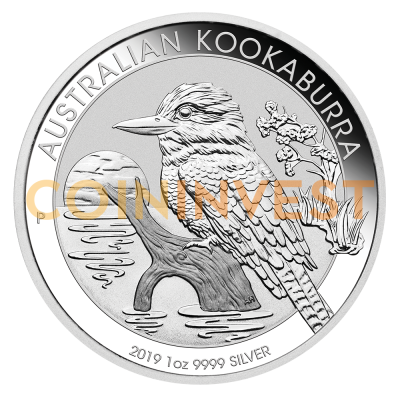 Don't miss out, order your 2019 1 oz Silver Australian Kookaburra coins now with coininvest.com. Single coins are shipped in capsules although smart investors can opt for foil-packed 20s or boxes of 100. All orders are fully insured for fast, safe shipping.